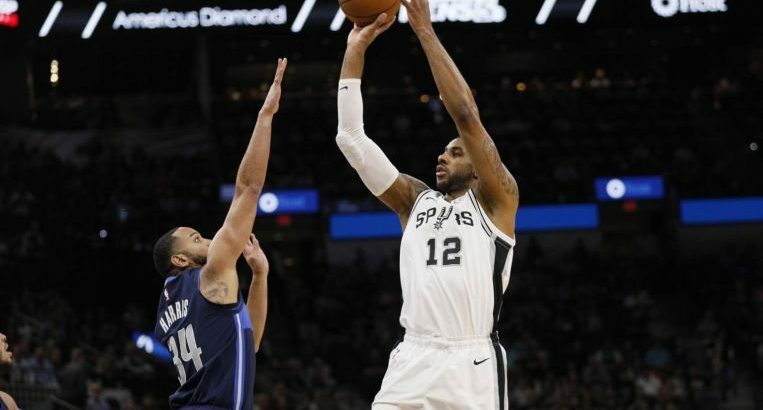 (REUTERS) – LaMarcus Aldridge poured in 34 points and took 16 rebounds to help propel the San Antonio Spurs to a resounding 105-94 win over the visiting Dallas Mavericks on Wednesday (April 10) in the regular-season finale for both teams. It was also the final game in the 21-year career of Dallas forward Dirk Nowitzki, who announced his retirement on Tuesday after the Mavericks’ final home game. Nowitzki led Dallas with 20 points in the contest and pulled down 10 rebounds in 31 minutes of play before leaving the court for the final time with 47 seconds remaining. The Mavericks trailed by 18 points in the first minute of the fourth quarter but reeled off a 13-0 run, capped by a 3-pointer by Courtney Lee, to pull within 83-78 with 9:28 to play. San Antonio reassumed control, however, by scoring the ensuing seven points and finished off the Mavericks down the stretch. DeMar DeRozan added 19 points for the Spurs (48-34), who finished the regular season with one more win that they had in 2017-18. Derrick White and Bryn Forbes added 14 and 10 points, respectively, for San Antonio, which has earned its NBA-record-tying 22nd straight trip to the playoffs. Justin Jackson and Lee added 14 points each for the Mavericks, with Devin Harris hitting for 12, Jalen Brunson scoring 11 and Dwight Powell grabbing 11 rebounds. San Antonio rolled to a 30-16 lead at the end of the first quarter behind 14 points from Aldridge. The Spurs increased their advantage to 47-26 on a driving layup by Rudy Gay with 4:38 to play in the second period and led 57-37 at halftime after a buzzer-beating 3-pointer by Davis Bertans. Dallas played the finale without sensational rookie Luca Doncic, who was ruled out of the game about an hour before tipoff with a bruised left thigh. With Wednesday’s win, the Spurs’ Gregg Popovich tied Lenny Wilkens for the most total wins – regular season and playoffs – by any coach in NBA history with 1,412.